Schools of fish swim by as you lounge on your float on the Sea of Cortez in the Islands of Loreto. Through the raft you glance through the transparent sea water at the vibrant reefs that house an underwater spectacle of marine life. Above the water, you take in the natural beauty of Loreto's islands; and wonder whether to order the fresh Chocolate Clams or the catch-of-the-day at dinner. It's a decision that you'll come back to later, after all, you are in Mexico, and everything can be accomplished.... well, manana. Bienvenidos (welcome!) to the historic town of Loreto. A place where you'll find historic buildings dotted with bright green plant life, exotic flowers bursting out of the concrete in fresh-fish taco stands, and the enchanting Mision de Loreto- a mission-style church that was built in 1697. 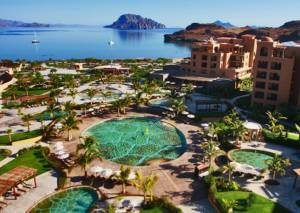 A burst of excitement has taken over the Baja-beauty of the Islands of Loreto. Travelers are discovering that this well-maintained village offers the best of both worlds for tourists who long to escape to an 'authentic-Mexico' with settings that take you back-in-time along with ocean activities that rival that of any other modern coastal city. For one, the Islands of Loreto boasts Mexico's largest marine preserve where dolphins, seals, turtles and sea lions all play in the sea. The underwater animal life alone rivals that of any world class aquarium. And for those who are partial to adventures on land; there is hiking, biking, and nature-tours that fill up a camera with pictures of radiant natural settings. Luxury Suites 3 Times The Size Of A Normal Hotel Room! An Ultra Luxury Oasis In The Middle Of The Desert.